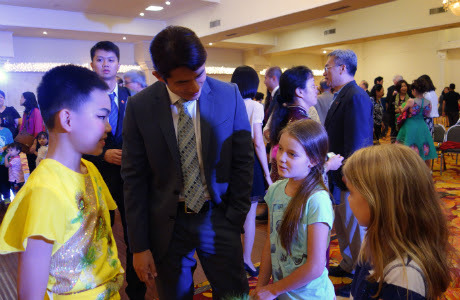 The world of Mandarin education is rapidly evolving as more local schools begin to integrate Mandarin language education into their school curriculum. In the digital age, language tools are constantly being created and modified to reach tech savvy students. 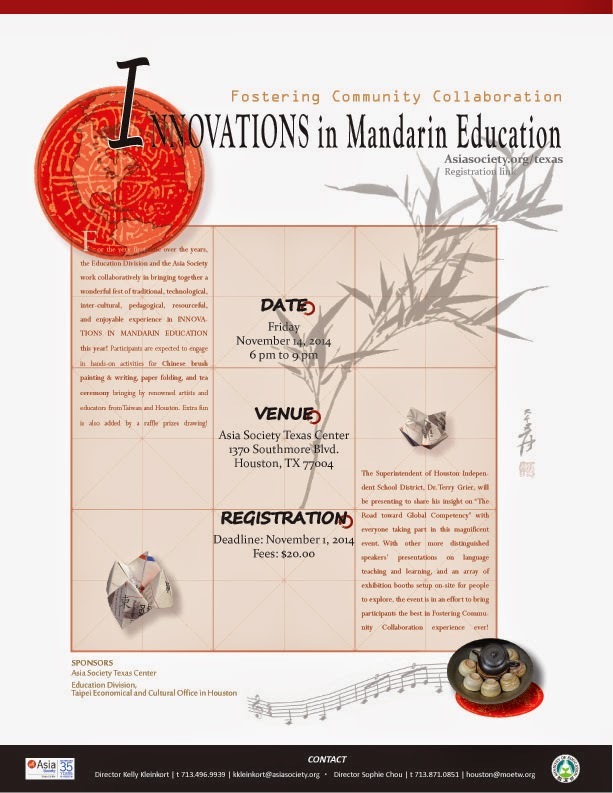 This three hour workshop, co-sponsored by Asia Society Texas Center and the Education Division of the Taipei Economic and Cultural Office in Houston, brings together experts, teachers, and leaders in education to infuse a global perspective, teach hands on classroom activities, and new digital technologies available to enhance classroom education. In an effort to foster the outstanding educators with global perspective, the Center for Teacher Education of Soochow University administers the one-month internship abroad program with the Department of English Language and Literature every summer. This year, the director of Center for Teacher Education, Professor James Lee, along with a group of 6 outstanding students selected from the Soochow University visited Houston from August 21 to September 20 for this internship program. The students have completed their internships in KIPP Intrepid Preparatory School and Sharpstown International High School for one week each during this program. 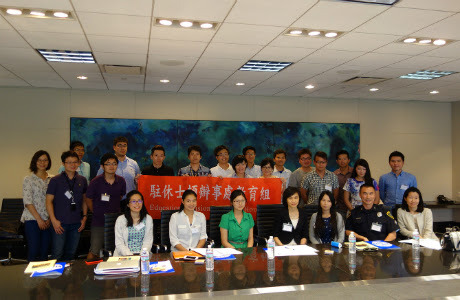 Besides, the Education Division of the Taipei Economic and Cultural Office also arranged several local education institutions field trips for this group, included University of St. Thomas, University of Houston, Taylor High School, and Houston Christian High School. The students had the chance to enhance their knowledge and skills of education through observation and interaction with the local educators and students. This internship abroad program initiated since 2009, and focus on the after-school learning of the disadvantaged students. This program is appreciated by the students and academic institutions, and increases the opportunities of education collaboration between Taiwan and the U.S. Through this internship program, these future educators of Taiwan would get to know better about the differences of the school operation, curriculum, and the classroom atmospheres between Taiwan and the U.S., and broaden their horizons. 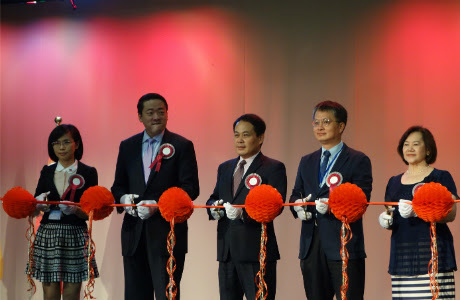 The director of Education Division, Sophie Chou, said that it is happy to see so many excellent Taiwanese students visit Texas for the academic exchange every summer. She encourages the students to embrace this opportunity to explore the diverse culture of the United States, acknowledge the education systems and environments of the U.S., and fully utilize these precious experiences and knowledge gained from the visits in the future education practice. “Taiwan Studies” is here defined as interdisciplinary or academic research and teaching with institutional oversight on topics germane to the study of Taiwan. Proposed studies may focus on topical issues in the humanities and social sciences as well as on other areas of significant research and pedagogical interests. Established universities worldwide with disciplines including but not limited to Sinology, East Asian Studies, and/or Chinese Studies are invited to submit proposals. (1) Taiwan Studies courses: these include a wide possibility of graduate and undergraduate programs, lectureship or credit courses on Taiwan Studies topics. 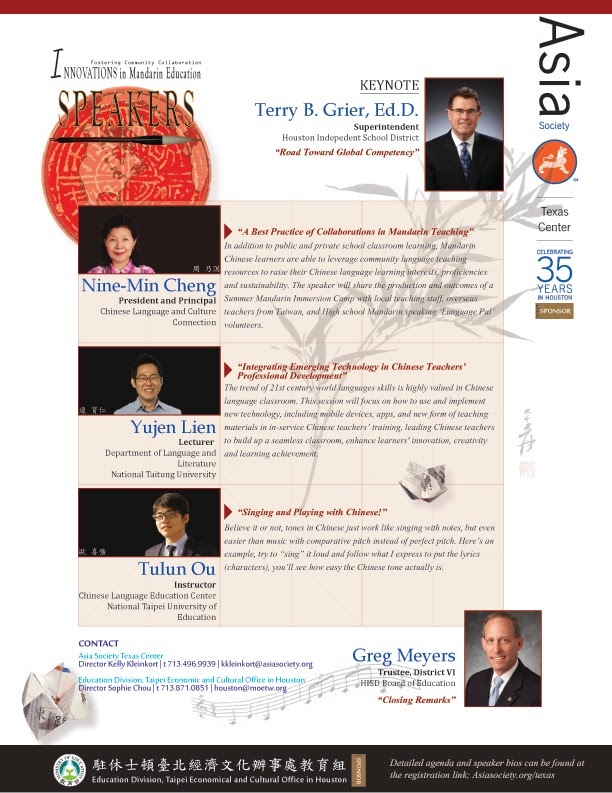 (2) Scholarly visits and exchange: establish a platform to invite accomplished local and international Taiwan Studies scholars to symposia and conferences and to conduct short-term research as well as engage in teaching and other academic activities. 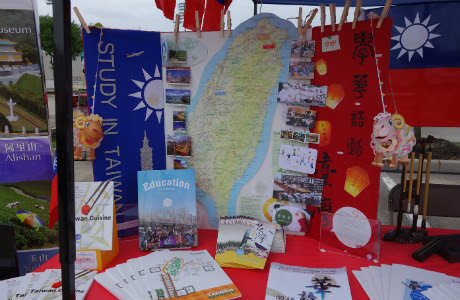 (3) Taiwan Studies publications: design a substantial curriculum and develop textbooks and teaching material for a Taiwan Studies program; publish relevant research papers, books, and academic journals. (4) Scholarships: set up Taiwan Studies scholarships for undergraduate and/or graduate students as well as post-docs. (5) Databases and archives: build or expand a databank of Taiwan Studies to include substantial amount of books and digital collections. (6) Academic activities: host Taiwan Studies conferences, seminars and forums, teaching workshops, exhibitions, and other related activities. 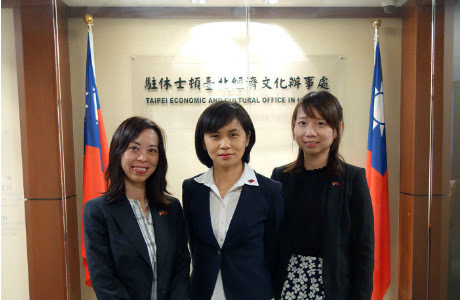 (1) Interested universities or research institutes (hereafter ‘Applicant’) should contact the nearest Taipei Economic and Cultural Office (hereafter ‘TECO’) or the Republic of China diplomatic mission (hereafter ‘ROC mission’) in their region before the end of September each year to discuss the possibility of a one-year or multi-year project to promote Taiwan Studies in the Applicant’s institution or region to begin in the following year. (2) Applicants should submit a Taiwan Studies Chair Project proposal, as well as a budget request to the nearest TECO office or ROC mission before the end of November each year. Late applications will not be accepted. (3) All applications will be reviewed by the MOE. Results will be announced before March of the following year. Applicants will be notified by TECO or by the ROC mission of the results. (4) Applicants may be required to amend their proposal and modify their budget as requested by the MOE. A draft Memorandum of Understanding (MOU) jointly prepared by the Applicant and TECO or the ROC mission incorporating said amendments will be submitted to the MOE for further review. (5) Following the approval of the MOU, the Applicant may proceed to sign the MOU with the MOE or representatives from the ROC mission. Upon signing of the MOU, the Applicant may submit an official receipt for funding for the approved Taiwan Studies Project. (1) Project Application Form (Attachment). (2) A summary of the proposed Project in Chinese (furnished by TECO or the ROC mission). (3) Other supporting documents or information. (4) Request for extended period of funding or renewal of the MOU is subject to satisfactory implementation of the previous stage of the proposed Project. A standard Project Implementation Review form is required (Attachment). (1) Annual audit: Audits for funds received for the year must be submitted to the MOE within one month after the Project ends for the current year. Please request assistance from TECO or the ROC mission for filling in and submitting the required forms (Attachment). Such audits shall include an annual achievement report as well as a statement of income and expenditures. The MOE will verify that all expenses listed on the audit forms comply with funding guidelines before funding allocation for the following year, if applicable, is processed. (3) All receipts, invoices, and proofs of expenditure must be retained by the Applicant and made available for examination upon request. (1) Funding is limited to one Project per Applicant only. Applicants whose subsidiary unit or units are already the beneficiaries of an ongoing Project funded by the MOE may not apply. (2) Maximum funding period for any approved Project is 5 years. (3) Maximum funding available to any Project in any one year shall not exceed 100,000USD. (4) Funding is based on the availability of matching funds (any amount) from the Applicant.